The UsuryFree Eye Opener: Grasshoppers and UsuryFree Creatives - Making a Difference !! Grasshoppers and UsuryFree Creatives - Making a Difference !! The UsuryFree Network is a private network of usuryfree creatives and grasshoppers. The UsuryFree Eye Opener is the electronic, print arm of the UsuryFree Network. Grasshopper Media is the electronic, video arm of The UsuryFree Network. Grasshoppers and UsuryFree Creatives twin their energies, skills, talents and frugal economic resources to network information and resources so that those who are ready and willing to learn what formal education neglects to teach will be motivated to follow their own self-imposed, courses of study. Grasshoppers are everywhere with their eyes, ears, common sense, cameras, laptop computers, etc. to record events and happenings and post them in cyberspace. Grasshoppers ask a lot of questions and question the answers. Grasshoppers are engaged in peaceful networking of the truth about a wide variety of topics. Grasshoppers are wide awake about what’s really going on behind the scenes of the drivel spouted by our so-called mainstream (lamestream) electronic and print media. Grasshoppers and Usuryfree creatives are proud to work together as we progress into this 21st Century. Grasshoppers and usuryfree creatives are both well aware that monetary reform is absolutely necessary if we are to complete the paradigm shift so that everyone on this planet can experience the reality of UsuryFree Living. Usuryfree creatives are a peaceful subgroup within the larger network of “Cultural Creatives." Usuryfree creatives aim to expose the design flaw of usury as the evil and immoral function within our orthodox economic system of usury-based, debt money. Usuryfree creatives advocate the concept of usuryfree living for everyone on this planet by promoting the usuryfree community currency movement as our last, best hope to save ourselves from eventual, financial enslavement by the greedy, global banking cartel and their puppet politicians at every level of modern government. Visionary, usuryfree creatives view a usuryfree time currency as the optimal tool to facilitate trading between sovereign individuals as well as municipalities, provinces/states and countries in the shifting paradigm. This is because one hour of time (time is labour, labour is time) has a constant value of sixty minutes everywhere on planet earth, thereby abolishing exchange rates that are currently in operation under the present economic paradigm. Grasshoppers and usuryfree creatives acknowledge that financial freedom is denied to all debtors the moment the ink dries on the promissory note held by the creditor. 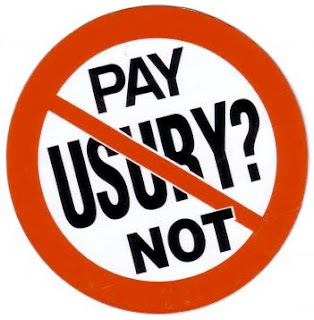 It is the creditors who have been granted the power to exact usury on any loan or mortgage, though the usury portion of any loan or mortgage is never created when the principal is created and issued into existence. Grasshoppers and usuryfree creatives recognize that our modern, economic system of usury-based, debt money is imploding at an unprecedented rate as this 21st Century recession deepens to a Depression that will make the Depression of the 1930’s look like a Sunday picnic. The death rattles of the greedy, global banking cartel are going to be chaotic. Enter The UsuryFree Eye Opener, the electronic, print arm of the UsuryFree Network. The UsuryFree Eye Opener is committed to observing and commenting on problems related to our usury-based, debt money system and advocating the usuryfree lifestyle as the optimal solution to embrace now, so that we will be prepared to launch our usuryfree lifeboats when their usury-based Titanic goes down. Indeed, grasshoppers and usuryfree creatives agree that a usuryfree lifestyle has the potential to rise as a phoenix from the ashes of usury-based, debt finance. Grasshopper Media and the UsuryFree Eye Opener both have blogs where items commonly dismissed as ‘not newsworthy’ are posted with space for comments, opinions and/or links to other relevant information. Grasshoppers and usuryfree creatives appreciate blogs where visitors can find the real truth about what’s going on in the world of local and global economics rather than accepting to be brainwashed and mind-controlled by the few remaining, mainstream media monopolies. Both blogs contain an abundance of information with news sources and articles on relevant topics that are open for discussion. The UsuryFree Eye Opener has another twin blog commonly referred to as the SDI (Self Directed Income) Eye Opener. This is relevant because the SDI industry (formerly known as network marketing or multi-level marketing is strategically positioned to lead the way as locavores emerge to seek to rebuild loyalty shopping within their respective local communities. Readers wishing to share information or articles are invited to submit them to Grasshopper Media or the UsuryFree Eye Opener for consideration. Input is welcomed in any or all of these different ways. Your perspective is welcomed and appreciated on whatever relevant topic interests you. Participate in our interactive social networking blogs Grasshopper Media and the UsuryFree Eye Opener and at our places at Facebook, Ning, Twitter etc. Become a self-appointed reporter and provide us with headlines, stories, website links etc. Become a grasshopper who doubles as a usuryfree creative or vice versa and contribute feature articles, video clips etc. To begin the process of becoming a grasshopper and/or a usuryfree creative simply visit the above-mentioned blogs and comment on any of the currently posted articles and/or video clips. Then share any or all of the articles and video clips with your friends in cyberspace and invite them to multiply and duplicate your efforts. Regular feedback and suggestions in the form of compliments or constructive criticism are always helpful. Be sure and refer Grasshopper Media and the UsuryFree Eye Opener to your friends in cyberspace as well as in real life. We are open to exploring advertising options so that we can begin building a loyal network of grasshoppers and usuryfree creatives who understand the importance of shopping within our own loyal networks. Both Grasshopper Media and the UsuryFree Network require energy - physical and financial to create, maintain, improve and expand our messages of mass instruction. Your generosity is always appreciated. 1. Grasshopper Media - Commonly known as Max Radico - Truly, Matthew David of the Racicot clan (non-corporate fiction). 2. The UsuryFree Eye Opener - Commonly known as Tommy UsuryFree Kennedy - Truly, Thomas Joseph of the Kennedy clan (non-corporate fiction).